I’ve mentioned here before that my husband and I were high school sweethearts. 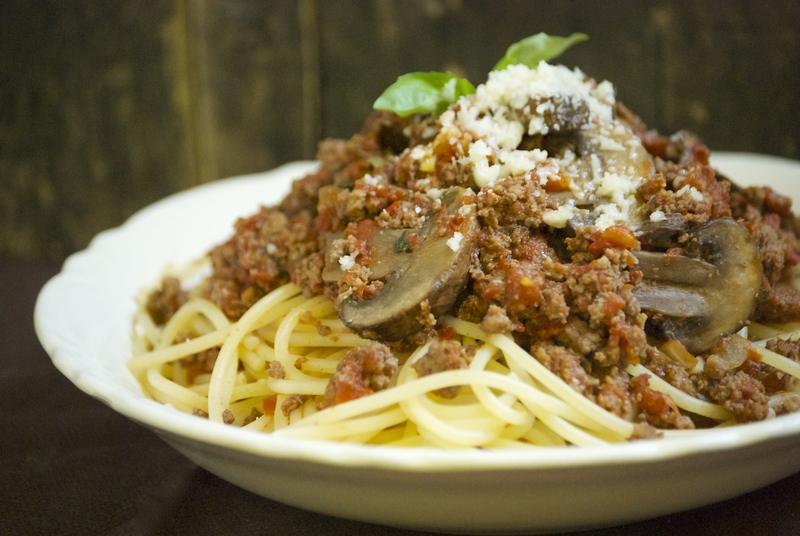 We’ve been together for many years, and if there is one dish that describes “us”, it is this spaghetti sauce. We’ve been making it together for as long as I can remember. And even though it has gone through a few subtle changes over the years (because I certainly wasn’t canning my own tomatoes in my dorm room), it has remained much the same as it did those many years ago. Many of you have been asking for this recipe, so I figure it’s time to to finally write it down and share it. 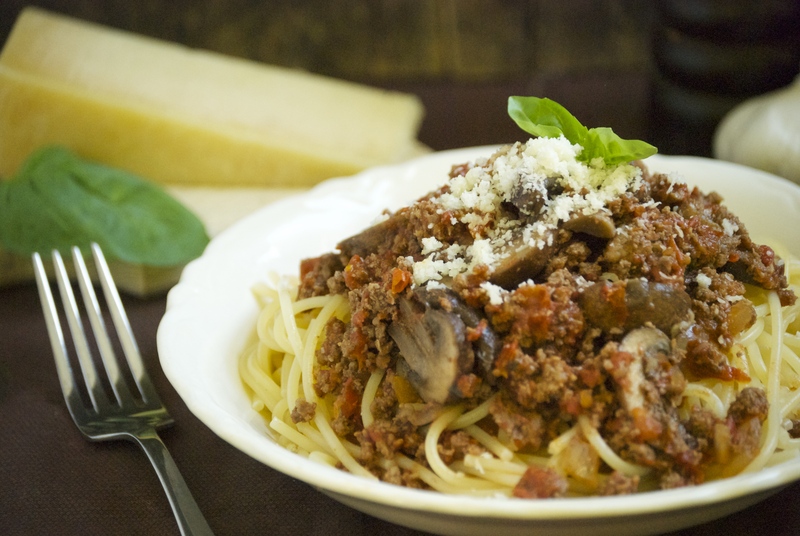 I mention on here fairly frequently that one dish or another is a family favorite. But this one is the family favorite. If the kids get to choose a meal, this is what they pick. Valentine’s Day rolls around, and this is what we have. It’s a bit odd, because this dish is ordinary, yet very special to us. A couple of things need mentioning. As I’ve said, I can my own tomatoes. I use roasted roma tomatoes for this sauce. I love how thick and rich they become, compared to regular tomatoes with their abundance of water. This sauce can be made with any variety of tomatoes, though I’ve settled on roasted romas as my favorite. The key here is to know what to do if your sauce has extra liquid in it that you don’t necessarily want. Watery spaghetti sauce is, to be honest, gross. Too much liquid, and it just doesn’t cling to the pasta. My point, is that you should do your best to find some good quality canned roasted tomatoes. Muir Glen is my recommendation, if you don’t can your own. Canned San Marzanos are also another excellent choice. Whatever type of tomatoes you choose, crushed or whole, etc– give them a few pulses in a food processor to break them up (or use your hands) so they aren’t chunky. If the sauce is too watery near the end of the cooking time, remove the lid and let it reduce a bit. Adding another dollop of tomato paste will also help. One more thing, I normally don’t use fresh basil in this sauce– instead I pull a bit out of my freezer that I’ve preserved for the winter. In the summer, when my basil is plentiful, I chop it and freeze it in muffin tins and ice cube trays. Then I vacuum seal it. When I need a bit of basil in the winter, I just pull one out and pop it into whatever it is that I’m making. I love this method. So, if you happen to have a freezer full of the same, use it! If you don’t, I’ve tested it with fresh basil, so you will know how much to use– feel free to add more, if you like. Just please don’t used dried– the flavor is not even comparable. 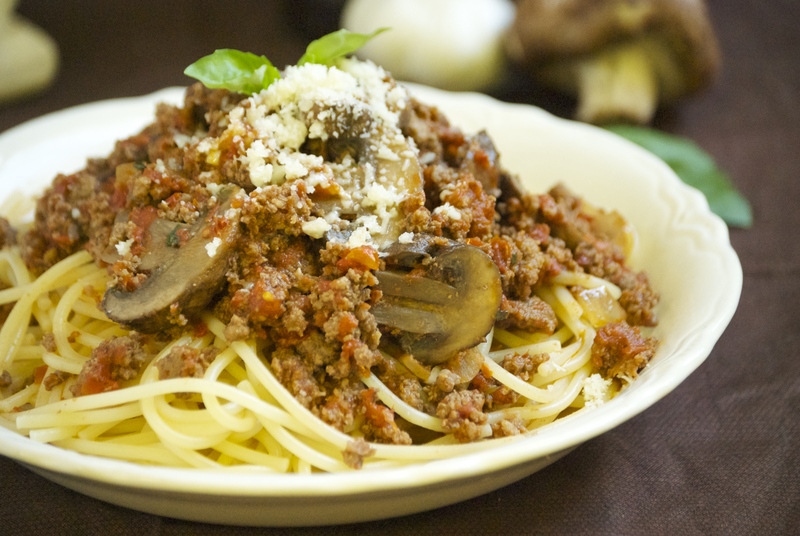 This sauce has a wonderfully earthy flavor from the herbs, garlic, and the crimini mushrooms. It’s a complex array of flavors that I heighten by using a bit of anchovy. As I’ve mentioned before, don’t be scared to use it. It adds such a nice umami flavor. The other integral ingredient is the bay leaf. The almighty bay leaf, in my opinion. It adds such a unique flavor that this sauce relies upon. 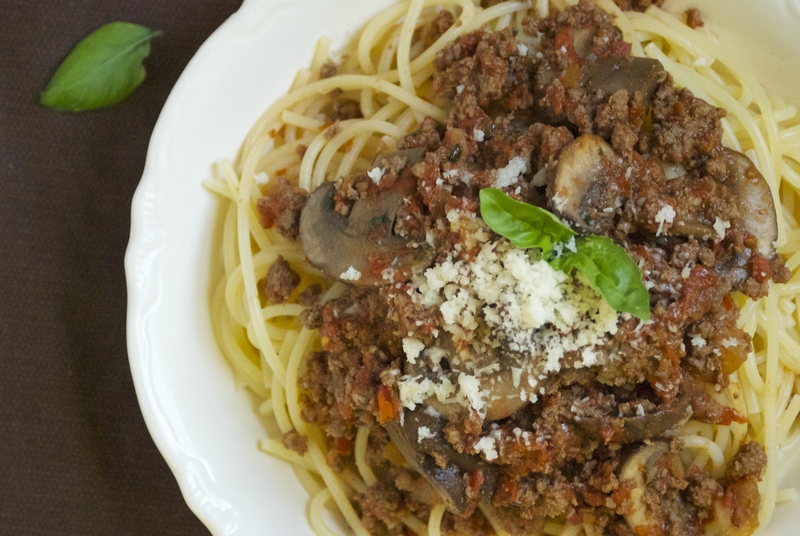 When the sauce is finished simmering, swirl in a tablespoon or two of good olive oil– it’s the perfect finish to the sauce. I hope you and your family enjoy this dish as much as we do. 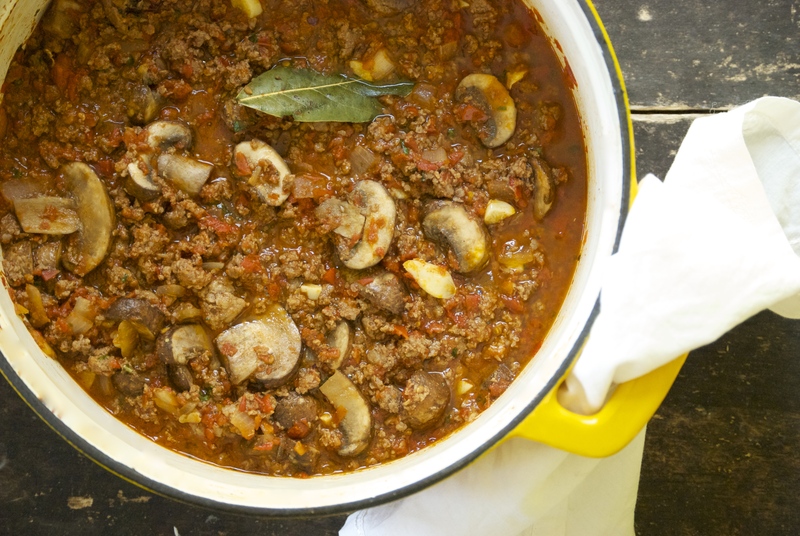 In a large Dutch oven over medium-high heat brown the ground beef, then drain the fat. Return the pan to the heat and add the onion, garlic, salt, and pepper to the beef. Sauté for a couple of minutes until the onions are somewhat tender, stirring frequently. Then add the crushed tomatoes, oregano, basil, tomato paste, anchovies, and bay leaf. Stir. Then finally add the mushrooms. Reduce heat to medium-low and let simmer for about 30-40 minutes, covered. Stirring frequently and carefully, as you don’t want the mushrooms to break apart. Monitor the amount of liquid near the end of the cooking time. Remove lid to reduce, if it seems too watery. 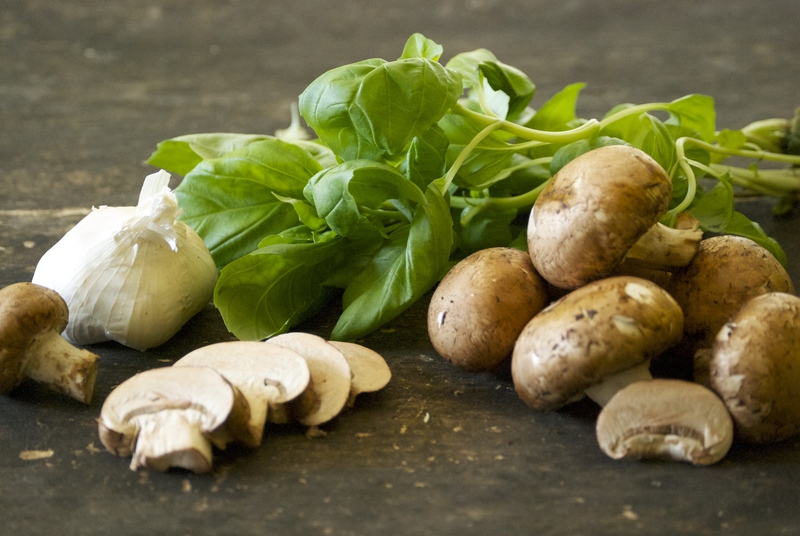 If it seems too thick, be patient– the mushrooms release a lot of liquid during the simmering time. When it is done, remove the bay leaf and stir in 1-2 tablespoons of olive oil. Adjust seasonings, if necessary. Serve with freshly grated Parmigiano-reggiano cheese and hot pepper flakes, if desired. Leftovers keep well in the refrigerator, or freezer. Enjoy! Splendid recipe. Can’t wait to make it.